TOUT BURBEE, concluded from page 2: Why it is a truly ghastly picture to contemplate, is it not? Can you imagine, anywhere else in the wide world, the existence of so unfair a system? But, thank God, the racing commission imposes no such limitations on any of their fellow men. They are men of logic, governed by logic; men of high principles guided by the golden rule The glue factory won't take my horse. Do any of you guys wnt it? ********* MISCELLANIA For the special PACIFICONGLOMERATION, the combozine flung together by that high flinger E Everett Evans, I am inserting pages 1-2 and 7-8. They should give a fair sample of Fan-Dango, even some mailing comments. For the benefit of combozine readers, I might mention that the four other pages of this issue consisted exclusively of comments on the previous FAPA mailing. Ordinarily, the ratio is better. 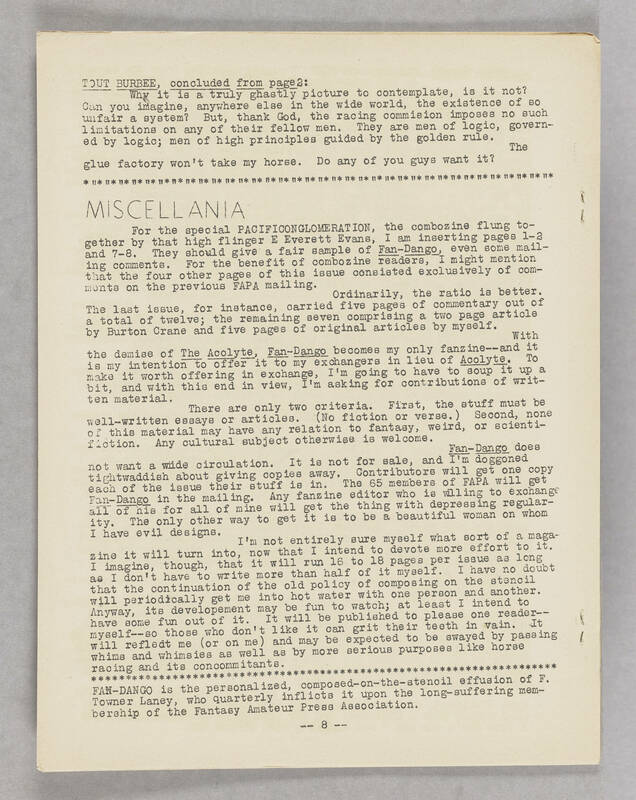 The last issue, for instance, carried five pages of commentary out of a total of twelve; the remaining seven comprising a two page article by Burton Crane and five pages of original articles by myself. With the demise of The Acolyte, Fan-Dango becomes my only fanzine--and it is my intention to offer it to my exchangers in lieu of Acolyte. To make it worth offering in exchange, I'm going to have to soup it up a bit, and with this end in view, I'm asking for contributions of written material. There are only two criteria. First, the stuff must be well-written essays or articles. (No fiction or verse.) Second, none of this material may have any relation to fantasy, weird, or scientifiction. Any cultural subject otherwise is welcome. Fan-Dango does not want a wide circulation. It is not for sale, and I'm doggoned tightwaddish about giving copies away. Contributors will get one copy each of the issue their stuff is in. The 65 members of FAPA will get Fan-Dango in the mailing. Any fanzine editor who is willing to exchange all of his for all of mine will get the thing with depressing regularity. The only other way to get it is to be a beautiful woman on whom I have evil designs. I'm not entirely sure myself what sort of a magazine it will turn into, now that I intend to devote more effort to it. I imagine, though, that it will run 16 to 18 pages per issue so long as I don't have to write more than half of it myself. I have no doubt that the continuation of the old policy of composing on the stencil will periodically get me into hot water with one person and another. Anyway, its development may be fun to watch; at least I intend to have some fun out of it. It will be publsihed to please one reader--myself--so those who don't like it can grit their teeth in vain. It will refledt me (or on me) and may be expected to be swayed by passing whims and whimsies as well as by more serious purposes like horse racing and its concommitants. ********* FAN-DANGO is the personalized, composed-on-the-stencil effusion of F. Towner Laney, who quarterly inflicts it upon the long-suffering members of the Fantasy Amateur Press Association. -- 8 -- .